Is it possible to shrink objects to the point of being invisible with the naked eye? For Marvel hero Antman, this is more than easy, but in reality, it’s quite difficult and limited to the materials we have available. However, a team of MIT scientists has now managed to create tiny 3D objects which can be measured down to the nanoscale. Their patterns include 3D objects fabricated using metals, quantum dots and DNA. “It’s a way of putting nearly any kind of material into a 3-D pattern with nanoscale precision,” Y. Eva Tan Neurotechnology Professor Edward Boyden of MIT said in a news release about the research, which was published last week in the journal Science. Scientists developed a new technique which allows them to fabricate any shape and structure they want. They used a polymer scaffold with a laser and attached other materials to the scaffold before shrinking it. This technique could be welcome in many scientific disciplines, including biology, robotics, optics and even medicine. Because the team used equipment already available in the vast majority of scientific labs, the technology should be widely accessible. The techniques currently used for creating nanostructures are quite limited; they include etching patterns against a surface with light. That technique can only be applied to 2D nanostructures. Printing tiny 3D objects required adding layers on top of layers, but the process is very slow and difficult. The MIT team introduced a new technique a few years ago; it uses high-resolution imaging of brain tissue, called expansion microscopy. They embedded the tissue into a hydrogel and then extended it. Since the technique enables 3D visualization of cells and tissues using normal hardware, the team decided to reverse the process to create tiny 3D objects. For the shrinking process, the team used an absorbent material made of polyacrylate (a material found in diapers) as the scaffold for the converting process. When all the materials are attached to one another in the right locations, the researchers uses acid to shrink them. Since the polyacrylate is charged, the acid removes all of its negative charge so that the gel contracts. 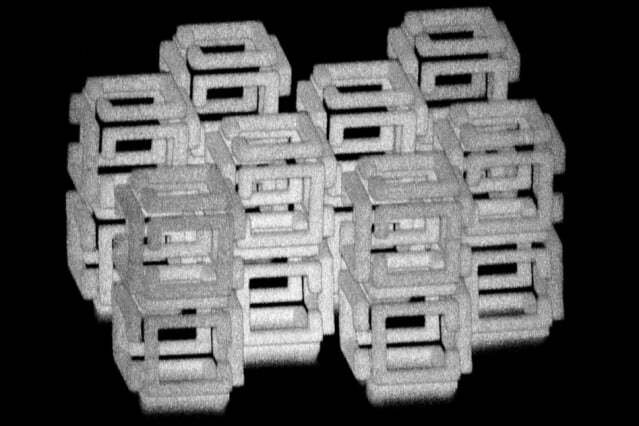 The researchers can shrink objects up to tenfold per dimension, which is a total of 1,000-fold shrinking in volume.